Sharing the point of view. 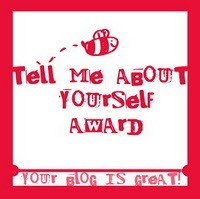 : ''Tell me about yourself'' award! Such a happy day today!!!! I got my first award! two times!! (that makes them two,right? ?hahahha) Anyway im super happy and honoured for that and i really want to give myself the same award to some blogs i think for my reasons they deserve it! Ποσο χαρουμενη ειμαι σημερααα?Πηρα το πρωτο μου μπλογκοβραβειακι!Δυο φορεες!! (αρα εχω δυο σωστα??? χαχχαχ)Τελοσπαντων,ειμαι παρα πολυ χαρουμενη και ειναι τιμη και περηφανια μου-χοχο- γιαυτο,και πραγματικα θελω να το δωσω και εγω η ιδια σε καποια μπλογκ που για τους δικους μου,μοναδικους και ανεπαναληπτους λογους πιστευω οτι το αξιζουν! So,first of all,i want to say a big THANK YOU to Liza (http://lizavel.blogspot.com/) and Marianne (http://lureofthedarkside.blogspot.com/) for giving me this little award in the first place.I will give it to them back,not because i have to but because i want too.I know this will be weird cause they already got it so they dont have to do the whole procedure again..But i wouldnt be fair if i didnt..I know its not a pay back thing,but i would it give it to them anyway (just to make things clear). 1.My ideal night out with a friend is going to theatre/movies and then for sushi..And that for an 18 yearold makes me a complete WEIRDO. 2.People who know me say I'm the biggest grouch and whiner that ever excisted.But that if you ask me is the biggest lie.EVER. 3.I would love so much to join FREE HUGS one day. 4.That makes me also the biggest hugsy that ever excisted. 6.Im really in love with all the things i mention to the description of my blog.Especially theatre and fashion events.I would kill. Now time to give the same award to others.I am supposed to do that for 15 other blogs..But at this time i cannot think of so many for which i want to.If i find more i will add them afterwards. http://wwwserendipity-nessy.blogspot.com/ because despite the fact she doesnt spends too much time at her blog she is really talented and love to read what she writes.i always do. xxxx I know..not 15...but favourite!! lots of love, Marianna at 7:09 μ.μ. Πιγκουίνος 10 Ιανουαρίου 2012 - 7:34 μ.μ. Πήρα βραβείο; Σε blog με μόδα; Παρότι κυκλοφορώ μόνο με φράκο από πούπουλο; Πόσο σουπεργουάου έκπληξη είναι αυτή! Πολύ σ'ευχαριστεί το πτηνό, που είναι εξαιρετικά φαντασμένο και εκτιμά ιδιαιτέρως τέτοιες επισημότητες, διότι του δίνουν το βήμα να κάμει δηλώσεις τύπου "δεν το περίμενα, το μεγαλύτερο βραβείο μου είναι οι αναγνώστες μου, τα χρωστώ όλα σε σένα Britney κ.λπ." Θενκ γιου, θενκ γιου, θενκ γιου! Antonio Jurado 10 Ιανουαρίου 2012 - 8:50 μ.μ. Stephanie Makropoulos 10 Ιανουαρίου 2012 - 10:16 μ.μ. Liza Vel 10 Ιανουαρίου 2012 - 10:52 μ.μ. MARIANNAAAA!s'euxaristw poly pou mou to adtapedwses!! !aaaaaa me kaneis poly xaroumeni gi mazi me to diko s pira kai allo ena smr!tnx tnx tnx!!!! !i loveeee sooo much!!!!! Marianne M. 11 Ιανουαρίου 2012 - 12:22 π.μ. Otan eida to comment sou sto blog mou to koitousa me matia gourlwmena kai den to pisteua kai twra vlepw to actual post (pw pw ta ellhnika mou, omws!!!) kai akoma den to pisteuw!!! euxaristw tosooooo poluuu!!!!! to award pragmatika den to edwsa me to skeptiko na m to dwsei kapoios pisw kai xairomai pou to katalavaineis. apla eprepe na dialexw kapoia blog pou agapaw kai gia mena gia na agapaw ena blog prepei na sumpathw kai ton blogger gia auto k to vraveiaki se sena k sth Liza pou sas sumpathw trela!!!! hehehehe thes na akouseis to ideal date mou na deis ti esti weirdo??? bungee jumping apo gefura, to sky fly tou allou fan park, kai antistoixa alla theotrela pragmata.. twra poia einai h weirdo e?? aaa kai to theatro-sushi einai k gia mena ena apo ta top rantevou. twra menei na vrw ton andra pou tha thelei na ta kanei ola auta, giati oloi monoxnotoi exoun ginei pia me kafeteries kai frapedes. oso gia to comment sou gia to liebster oti san ellhnida den mporouses na dwseis germaniko vraveio...ela mwre ti mas eftaixan kai auta ta germanakia?? egw proswpika exw gnwrisei gamata atoma apo germania allo pou merika einai kai koukliaaaaaaaa. gia prwth fora KAI mesa apo to blog mou tha deixw ston kosmo ti trelengko eimai. e oxi mono mesa apo ta blog twn allwn. Marianne M. 11 Ιανουαρίου 2012 - 12:55 π.μ. nessy 11 Ιανουαρίου 2012 - 4:03 μ.μ. katerina karatsoli 11 Ιανουαρίου 2012 - 4:22 μ.μ. I want to thank you so much for visiting my blog and for you lovely comment. Wishing you the best for the new year. Sam 11 Ιανουαρίου 2012 - 11:23 μ.μ.